TheConservation Planning Tool (CPT) is an Access® databasethat captures the targets, stratification units, and goals of thecurrent ecoregionalplan. It provides more details than provided in this website or thewritten executive summary. Because it includes sensistive data, such aslocations of endangered species and private land ownership information,we restrict distribution to TNC staff and our Hawai‘iconservation partners, who may request access to the CPT databasefor theHawaiian High Islands Ecoregion via the links below. Remainingnative ecological systems of the island of O'ahu are shown in colorsfrom green to brown. Anthropogenic and alien-dominated areas are shownin pink. Over 80% of the state's population is found on O'ahu, andurban and residential development has displaced most of the coast andlowland systems. 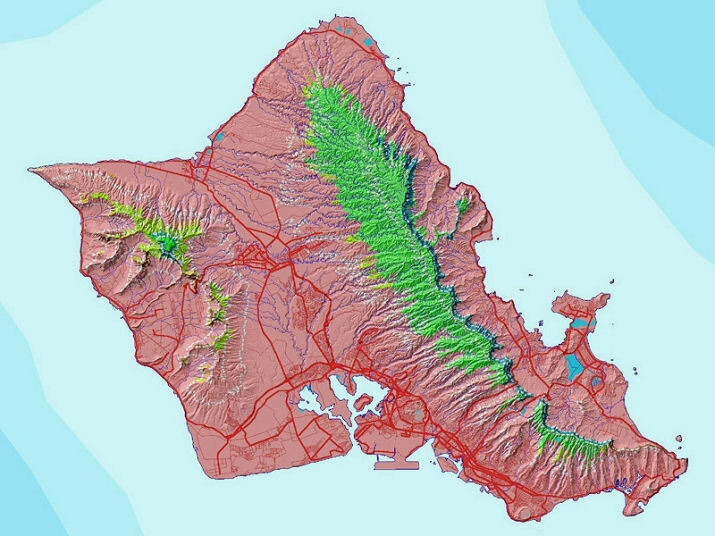 The CPT database documents all conservation targetsfor O'ahu and the rest of the Hawaiian High Islands Ecoregion.